Anyhow, back to sandals. These come in burgundy, stone or black but my size wasn't in stock. My feet are hard to fit properly. The left foot is well over a size different to the right and the arch is fallen. Birkenstocks are heavenly comfortable on the right foot but abysmally uncomfortable on the left as the side presses into the arch bones. Tevas suit my feet and the support they give is great as my feet are very flat. Doctors at school used to ask if they ached, even when I was quite young. I've been tracking these down all week in shoes stores all over Sydney and on the internet too. A couple of days ago I was in Burwood and walked past the Athlete's Foot shop where I bought the casual pair last summer. On an impulse I entered although I could not see the style in their display. A very competent, young assistant took my order. He knew exactly what I wanted and knew they had my size. A quick try on and walk around the shop and I bought them. They are leather and have a leather lining on top of sole which is cork. They are light as a feather and very comfortable. They had just arrived in the shop and not yet been entered in their stock so he had a bit of fiddling to do to get computer to sell them to me. 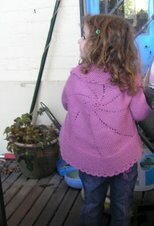 To prove I have been doing some knitting, here is the almost completed first section of Catkin. 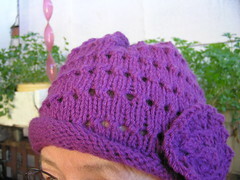 available on Ravelry and elsewhere. Next section is the white and the last is a mix, creating a catkin effect with slipped stitches. The pattern is for finer wool but this is Cleckheaton Country 8 ply as I thought something warmer would be good. It's strange but the green is quite splitty, both balls so far, while the white is fine. The colour is less blue and rather more a gum leaf grey/green mix which is very calming to look at. I have one more garter stitch strip to do before the second section. It's been slow going. I felt terrible for several days after the stress of MIL's funeral a week ago. However, each son has thanked me for attending and that was really the reason I forced myself to go. I could not concentrate at first on what I was doing and had to rip back a couple of times because I had more stitches one side of centre than the other. More than once, unfortunately. As I've mentioned several times, I am gradually becoming more familiar with my new camera, a Nikon D3100. I'm even contemplating buying another lens for it. There was a fire up the road a couple of days ago, a truck actually on Parramatta Road. I could get the billowing smoke, but a zoom of some sort would have made a much better photo than I could take with my current 18-55 mm lens. I've been in that situation before. So I intend to ask Santa for such a lens. The camera has in-camera editing functions. Now many of these I've done with an editing program. However I hadn't used it in-camera itself. The subject in itself is scarcely inspiring, but it was suitable to fiddle with. The effect is called colour outline and I could also turn the photo into something which looked like miniature furniture for a dolls' house. I can add star bursts to light sources and crop within the camera. Multiple photos can be layered on each other and more. It must be Shoe Week!! What a kind and resourceful young man too, your shoes are lovely. They do look light!! Now, if only they had green..
And there's your shawl, it is a very nice green. I can't knit when I am too tired either. You have lovely sons, they must really have appreciated that you attended the funeral. I can 'cartoonise' in my editing programme and on Picnik too. You are doing so very well with your new camera, it would be a shame not to use it to its full potential. Indeed it must have been shoe week - I too bought myself a pair of shoes; the first since before DD's wedding in January 2009! I hope you get good wear and comfort from yours. I love that sketch form a photograph - very nifty!